I remember meeting Gustav Andressen of The Modern Nomad at the 2011 Bay Area Rodeo. Swedish by birth, he left his job in London for a life out on the road. No home, no corporate ladder, just a guy out to experience what the world had to offer. That encounter had a lasting impact on me. I’ve followed his blog and always had more than a “hmmm” when I’ve come away from his posts: particularly this one. The open road has always had a draw for me. I remember as a kid looking at our World Atlas and spending hours learning about new places. I was enthralled with Idaho as it was full of mountains. They were big mountains, not like the hills we had back east. I wondered how people lived at the tops of mountains. I wondered what the view was like. I wondered how cold it got. I longed to know that experience. There is a scene the movie Mr. Destiny where we see the effect of decision on one’s life. Each decision is a fork. There is an in life has an effect on the rest of life. There are two agents in life that shaped my experience: change and community. I’ve been blessed to richly experience both. I’ve learned that both change and community work together in driving the richest and most fundamental engagements in life. Change brings about growth and community is about support. I’ve found both in all sorts of places. 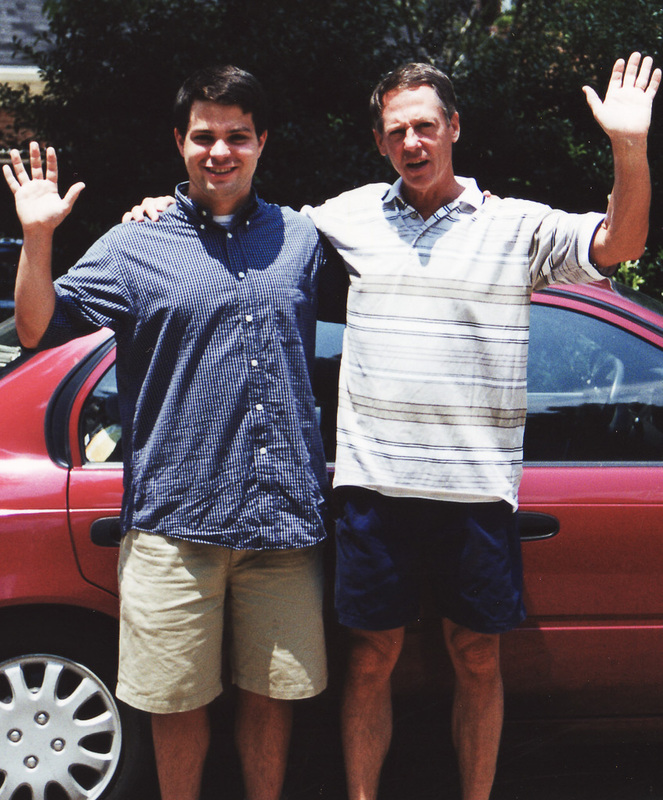 Dad and I waving goodbye as I was about to drive across the United States in a Toyota Corrola. I didn’t expect to end up in California. I remember visiting here on a family vacation well before I moved here and seeing such a different world than I was used to. The culture was different, the cost of living was insane, and I didn’t think I liked big cities. After a reassuring encounter with the pharmacist at Nob Hill Foods when my insulin went bad, I began to feel that California could be home. It was the right professional move and I’m thankful for my years here. I’ve found over the years that community always meets you in the context of change. I soon met friends at work and through the church. Life was as full and rich as it had been in back home. I’ve been fortunate to find community in a number of places: technology, motorcycles, diabetes, amongst others. When I came out, another community was there to meet me. Now life brings another transition. When I left Sydney the first time, I knew I wanted a second date. I really did enjoy the time we spent together. I’m now on a three month secondment down under. Sydney and I are dating! My life in California is packed in a storage unit and I’ve got two suitcases that will carry me through the next several months. I’ll be blogging a lot more regularly in a new series called “85 days in a foreign land”. I’m planning on taking a photo a day like I did for “Project 365” to get more out of each day while I’m in Australia. Will this be long term? I’m not sure. Will it be one heck of a ride? Absolutley! Hey, that was a nice car!